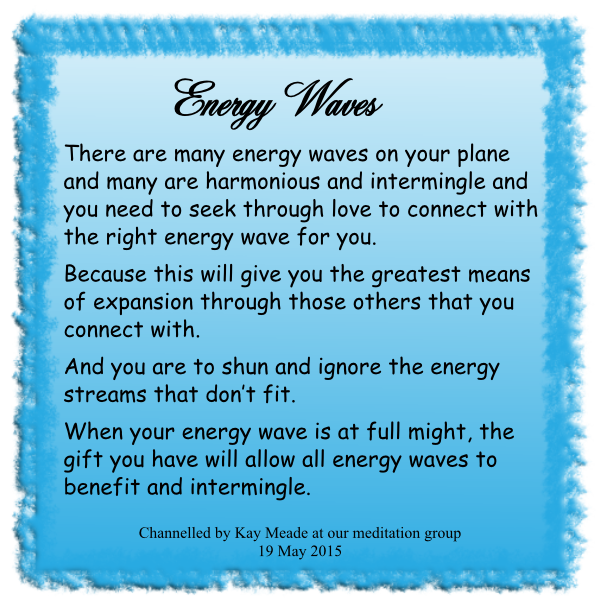 This is one of the earliest messages that Kay channelled from The Circle of The Light of The Love Energy when they were first asking us to spread the messages channelled from them through Kay…………….. 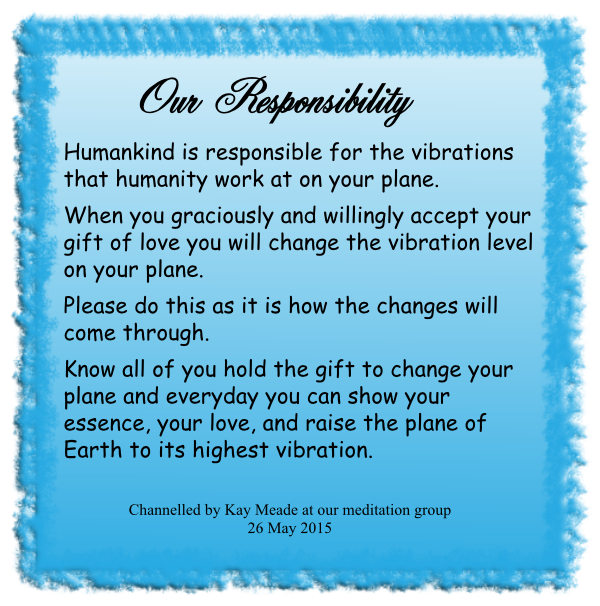 Check out the books of Kay Meade’s channelled messages …. available from Amazon.com in paperback and Kindle e-book formats and as e-books from the Apple iBookstore, ‘Barnes and Noble’ website and Kobo books website. Search on ‘Kay Meade’ on these websites. 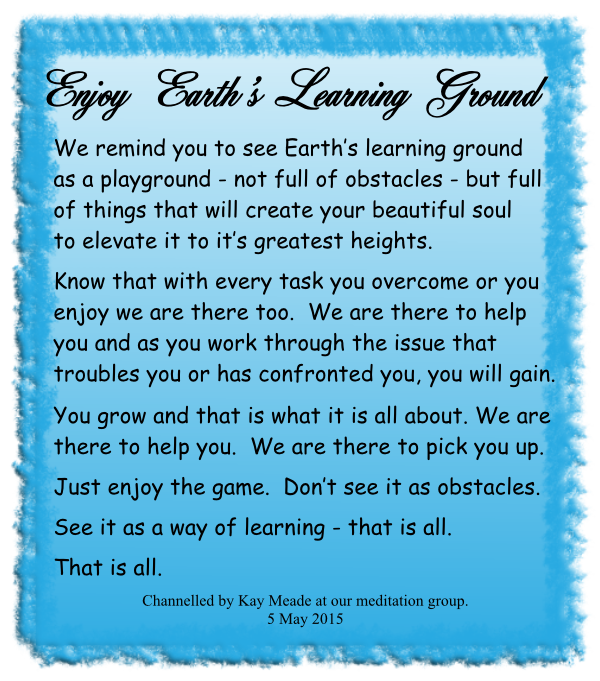 The books are:.. ‘Earth Messages of The Love Energy’; ‘Love is the Key’; ‘Poems for You’. There is also Kay’s meditation CD called ‘Meditations for Spiritual Development’ available from amazon.comPlease tell others who might be interested in spirituality. 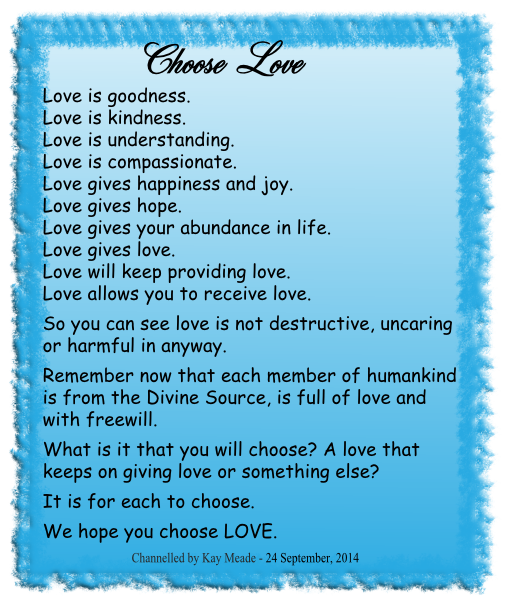 Channelled message – Who are ‘The Circle of The Light of The Love Energy’? 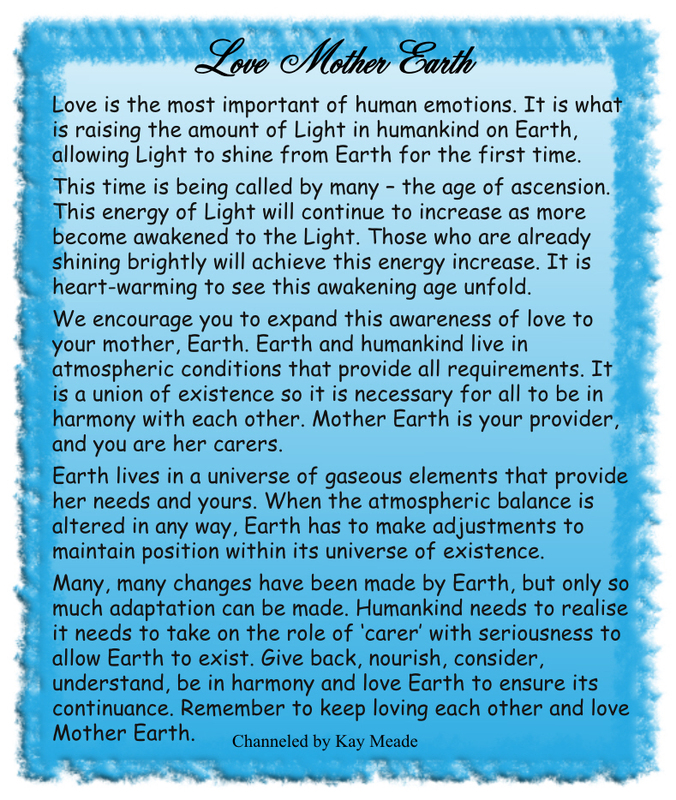 Energy from ‘The Circle of The Light of The Love Energy’ – remember it’s the purest energy of all. We want our message to be passed on. It is how you will all reach for your heavenly stars. It is how the awakening of the collective consciousness will happen. Pass on information to raise vibrations and help with the transition already taking place on Earth. It will accelerate and aid this event. Our love is an almighty power and this is the sort of power that needs to be experienced and activated in all transactions on Earth. Power is power of the Light. It is almighty as we have said, but it is gentle, understanding, kind. 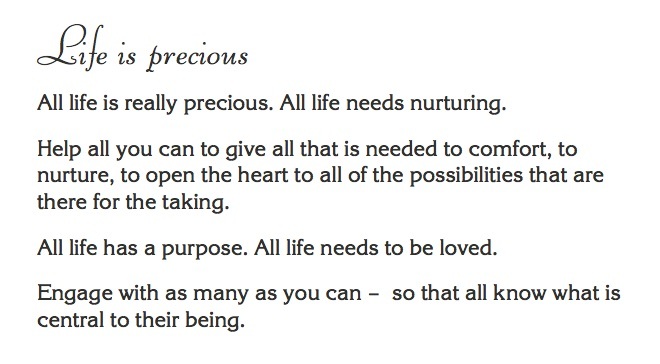 It is nurturing Love Energy. It needs to embrace all actions, calming all souls. Being awakened to the Light allows our energy to light every prism of the being and the Earth. It is important to pass on. We’re giving information in stages, little by little. Please tell others who might be interested in spirituality. 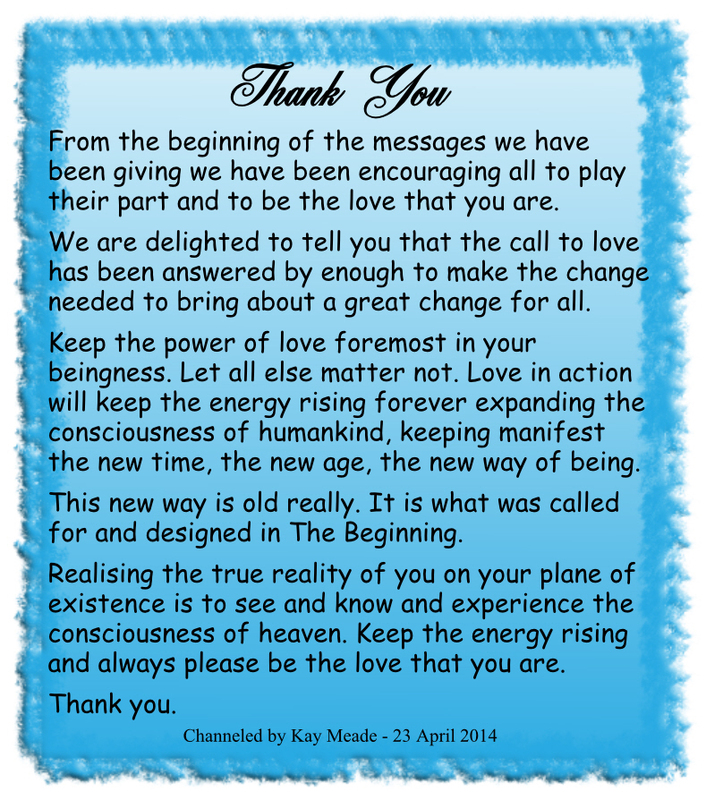 From Kay Meade’s book of spiritual and inspirational messages for humanity ‘Earth Messages of the Love Energy”. Available in paperback or Kindle e-book formats. Click on amazon for more details.